This update of the classic French starter enhances the traditional plate of herring and potatoes with two types of beets — raw and cooked. Sliced red onion and cilantro add tang, and a lemony vinaigrette is drizzled on top. When I enountered a similar version at the Paris bistro Le Desnoyez, I found it so fantastic that I decided to make it at home. You may have to improvise if the ingredients are not available where you live. For example, you could substitute smoked mackerel for the herring. The striped beets shown in the photo, an heirloom variety called chiogga, may also be hard to find. You can use regular red beets or another heirloom variety instead. Red beets are sold already cooked at French markets, which simplifies matters. If beginning with a raw red beet, boil it in its skin until tender, then drain and remove the skin when cool. As for the potatoes, choose a variety that will remain firm when boiled. This dish may be served as a starter or a lunch dish. If you’re having wine, go for a crisp white. The quantities below will serve two people. Peel the potatoes and boil in salted water until tender. While the potatoes are boiling, prepare the other ingredients. Remove the skin from the herring fillets. Slice crosswise into manageable pieces. Peel and slice the cooked beet. Ditto the raw beet. Peel and slice the onion into thin rounds. Combine the lemon juice, olive oil, salt and pepper in a small bowl. Go easy on the salt, as the herring is already salty. Stir well to blend. When the potatoes are tender, drain, chop into chunks and transfer to a separate bowl. Pour half of the sauce over the potatoes while they are still hot. Stir. 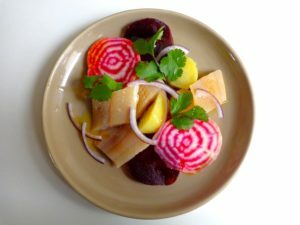 Arrange the herring pieces, potatoes and beet slices on individual plates. Top with the cilantro. Drizzle with the remaining sauce. Serves 2. This dish is best if served while the potatoes are still warm.